Random forest is a type of supervised machine learning algorithm based on ensemble learning. Ensemble learning is a type of learning where you join different types of algorithms or same algorithm multiple times to form a more powerful prediction model. The random forest algorithm combines multiple algorithm of the same type i.e. multiple decision trees, resulting in a forest of trees, hence the name "Random Forest". The random forest algorithm can be used for both regression and classification tasks. Pick N random records from the dataset. Build a decision tree based on these N records. Choose the number of trees you want in your algorithm and repeat steps 1 and 2. In case of a regression problem, for a new record, each tree in the forest predicts a value for Y (output). The final value can be calculated by taking the average of all the values predicted by all the trees in forest. Or, in case of a classification problem, each tree in the forest predicts the category to which the new record belongs. Finally, the new record is assigned to the category that wins the majority vote. As with any algorithm, there are advantages and disadvantages to using it. In the next two sections we'll take a look at the pros and cons of using random forest for classification and regression. The random forest algorithm is not biased, since, there are multiple trees and each tree is trained on a subset of data. Basically, the random forest algorithm relies on the power of "the crowd"; therefore the overall biasedness of the algorithm is reduced. This algorithm is very stable. Even if a new data point is introduced in the dataset the overall algorithm is not affected much since new data may impact one tree, but it is very hard for it to impact all the trees. The random forest algorithm works well when you have both categorical and numerical features. The random forest algorithm also works well when data has missing values or it has not been scaled well (although we have performed feature scaling in this article just for the purpose of demonstration). A major disadvantage of random forests lies in their complexity. They required much more computational resources, owing to the large number of decision trees joined together. Throughout the rest of this article we will see how Python's Scikit-Learn library can be used to implement the random forest algorithm to solve regression, as well as classification, problems. In this section we will study how random forests can be used to solve regression problems using Scikit-Learn. In the next section we will solve classification problem via random forests. The problem here is to predict the gas consumption (in millions of gallons) in 48 of the US states based on petrol tax (in cents), per capita income (dollars), paved highways (in miles) and the proportion of population with the driving license. For the sake of this tutorial, the dataset has been downloaded into the "Datasets" folder of the "D" Drive. You'll need to change the file path according to your own setup. We can see that the values in our dataset are not very well scaled. We will scale them down before training the algorithm. Two tasks will be performed in this section. The first task is to divide data into 'attributes' and 'label' sets. The resultant data is then divided into training and test sets. The RandomForestRegressor class of the sklearn.ensemble library is used to solve regression problems via random forest. The most important parameter of the RandomForestRegressor class is the n_estimators parameter. This parameter defines the number of trees in the random forest. We will start with n_estimator=20 to see how our algorithm performs. You can find details for all of the parameters of RandomForestRegressor here. With 20 trees, the root mean squared error is 64.93 which is greater than 10 percent of the average petrol consumption i.e. 576.77. This may indicate, among other things, that we have not used enough estimators (trees). 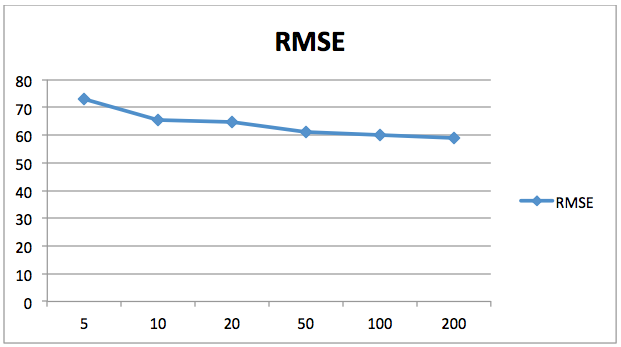 The following chart shows the decrease in the value of the root mean squared error (RMSE) with respect to number of estimators. Here the X-axis contains the number of estimators while the Y-axis contains the value for root mean squared error. You can see that the error values decreases with the increase in number of estimator. After 200 the rate of decrease in error diminishes, so therefore 200 is a good number for n_estimators. You can play around with the number of trees and other parameters to see if you can get better results on your own. The task here is to predict whether a bank currency note is authentic or not based on four attributes i.e. variance of the image wavelet transformed image, skewness, entropy, and curtosis of the image. This is a binary classification problem and we will use a random forest classifier to solve this problem. Steps followed to solve this problem will be similar to the steps performed for regression. As was the case with regression dataset, values in this dataset are not very well scaled. The dataset will be scaled before training the algorithm. In case of regression we used the RandomForestRegressor class of the sklearn.ensemble library. For classification, we will RandomForestClassifier class of the sklearn.ensemble library. RandomForestClassifier class also takes n_estimators as a parameter. Like before, this parameter defines the number of trees in our random forest. We will start with 20 trees again. You can find details for all of the parameters of RandomForestClassifier here. 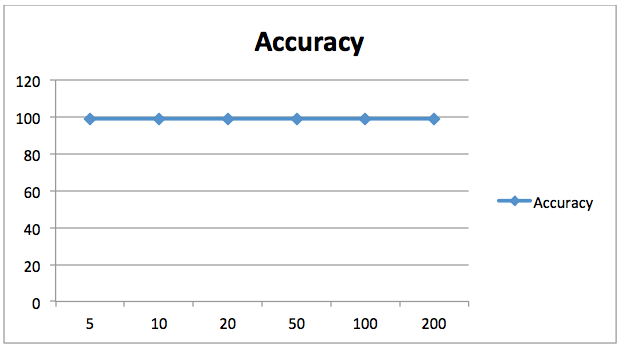 The accuracy achieved for by our random forest classifier with 20 trees is 98.90%. Unlike before, changing the number of estimators for this problem didn't significantly improve the results, as shown in the following chart. Here the X-axis contains the number of estimators while the Y-axis shows the accuracy. 98.90% is a pretty good accuracy, so there isn't much point in increasing our number of estimators anyway. We can see that increasing the number of estimators did not further improve the accuracy. To improve the accuracy, I would suggest you to play around with other parameters of the RandomForestClassifier class and see if you can improve on our results. Courses like these give you the resources and quality of instruction you'd get in a university setting, but at your own pace, which is great for difficult topics like machine learning.